by Rev. John J. Keane, S.A.
Prayers for Christian Unity were heard loud and clear in the Friars’ Chapel of Our Savior in Brockton, MA, on Sunday afternoon, January 22, 2017. Following a program organized by the Christian Churches in Germany for Christians throughout the world, 65 people from local Christian Churches - Catholic and Nazarene - joined together in heartfelt prayers. The program was presided over by the Rt. 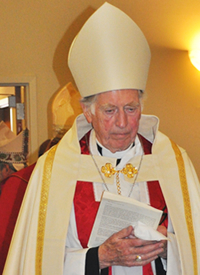 Rev’d James Hiles, Bishop and Pastor of St. Paul’s Anglican Church, Brockton. A powerful sermon was delivered by the Rev. Gregory Davidson, Lutheran Chaplain at Good Samaritan Medical Center in Brockton. Pastor Davidson spoke of two events that should be remembered: the posting of 95 Theses on the door of the castle church in Wittenburg by Martin Luther five hundred years ago in 1517 and the Berlin Wall that was taken down “brick by brick” in 1989. “Luther sought”, Davidson declared, “to use the academic debate process of the university to clarify the Church’s understanding of sin and realization of forgiveness.” However, Luther’s call for such a debate sparked instead social turmoil and walls were erected by princes and bishops. The ecumenical service suggested that we use a symbolic wall of bricks. We built one in the sanctuary - thirteen bricks representing lack of love, hate, contempt, discrimination, etc. – bricks that will always keep people apart. The Solidarity Movement in Poland helped to finally dismantle the Berlin Wall “giving hope to the other nations and peoples of Eastern Europe” Davidson said. But, “the most pressing challenge today is aloneness, what you might call solitarity” - a wall made up of those very same bricks mentioned above he pointed out. “Only through openness to the gracious gift of salvation through trust in Jesus Christ’s death and resurrection … can the walls that separate us be transformed from human division into holy community”, he concluded. The organ player was Ms. Doreen Gonick and refreshments after the service were provided by the lay Order of St. Francis. 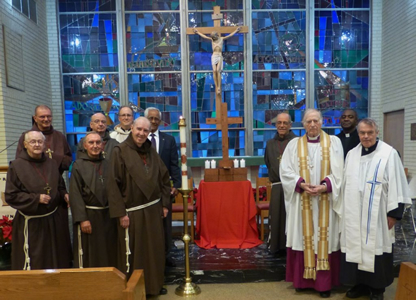 The Daily Scripture and Prayer Guide for the 2017 Week of Prayer for Christian Unity were blended into the Friars’ daily recitation of the breviary in the chapel for eight days. Three hundred prayer cards were distributed to the people visiting the chapel requesting them to pray for Christian Unity during the year.